Abstract: The GA-8IPE1000 Pro2-W comes with a wireless LAN option, Intel CSA Gigabit LAN controller, IEEE 1394 firewire, onboard 5.1 audio and dual BIOS. If you're a frequent reader of PCStats you probably noticed that we reviewed the original Gigabyte GA-8IPE1000 Pro 2 a while back. This time around Gigabyte GA-8IPE1000 Pro2-W has an added USB 802.11b wireless adapter bundled into the onboard package, hence the "W" moniker in the name. Wireless networking has come a long way in the last year, from merely a novelty feature to revolutionizing the networking industry! 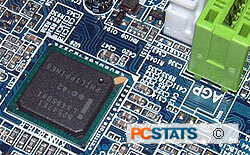 With Intel integrating 802.11b wireless technology in all Centrino based laptop's, it was only a matter of time before desktop computer feature wireless integrated in the motherboard. In fact where we are, they are already a few "hot spots" where people can surf the internet for free as long as they have the appropriate hardware. I recently installed an 802.11g wireless LAN at home, and have never looked back! It doesn't feel any slower than my old 100Mb wired LAN setup, nor has my lag time increased when gaming! Of course there's more to the GA-8IPE1000 Pro2-W than just a funky wireless LAN option, the motherboard also has an onboard Intel CSA Gigabit LAN controller, IEEE 1394 firewire, onboard 5.1 audio and dual BIOS'. Perhaps one of the most important compelling features is that the Gigabyte GA-8IPE1000 Pro2-W is already Prescott ready. Many original i865PE/i875P motherboards on the market are not set up to work with the increased power demands of Prescott.... or they may be, you really don't know for certain. 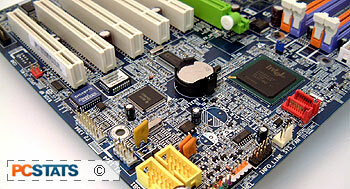 That mystery doesn't surround the rather well equipped GA-8IPE1000 Pro2-W motherboard. The GA-8IPE1000 Pro2-W supports all current Socket 478 Pentium 4 processors (400MHz, 533MHz and 800MHZ FSB) and with its four DIMM slots, up to 4GB of PC3200 DDR RAM. Since the layout of the GA-8IPE1000 Pro2-W is identical to that of the GA-8IPE1000 Pro 2 PCstats reviewed previously, everything we said back then still applies here. 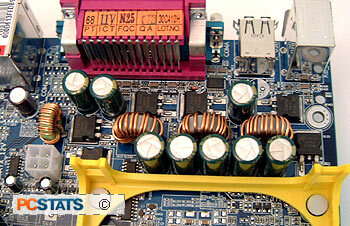 Headers are placed near the edge of the socket help keep all the cables out of the way of the other system devices. Gigabyte also colour coordinate their front panel I/O header, and indicate the positive values as well - this helps when hooking up the front panel LED on light for example (white wire is positive, green wire, negative). 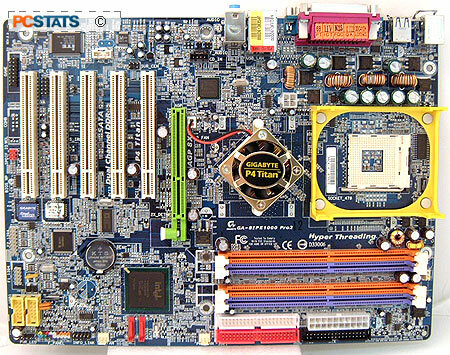 We've tested a lot of motherboards here at PCStats and I think it's safe to say that Gigabyte boards are among the most user friendly. While we usually don't go into much detail on the software that ships with motherboards, I have to give credit to Gigabyte for including Norton Internet Security 2003 along with the GA-8IPE1000 Pro2-W. Viruses are an escalating problem, and it's pointless to connect a PC to the internet, or even network these days without some form of virus protection. There aren't too many things to complain about here; Gigabyte are notorious for tossing in tones of extra bundled kit, and the layout and useability of their boards is super, but for some reason the trusty old clear CMOS jumper seems to have been annexed. This is probably due to the dual BIOS and integrated recovery system Gigabyte build in (ie, there is no need for a jumper in the first place), but then on the other hand, you can still reset the CMOS by shorting two solder points... That's a pain to do, so my complaint is this; either include the clear CMOS jumper, or remove it entirely! Next up, how about a little 802.11b wireless networking integrated with your desktop PC motherboard? Sound too good to be true, well, not in the case of the GA-8IPE1000 Pro2-W.
Pg 2. Onboard 802.11b wireless!